KBG syndrome is a very rare autosomal dominant disorder, characterized by macrodontia, distinctive craniofacial findings, skeletal findings, post-natal short stature, and developmental delays, sometimes associated with seizures and EEG abnormalities. So far, there have been over 100 cases of KBG syndrome reported. Here, we describe two sisters of a non-consanguineous family, both presenting generalized epilepsy with febrile seizures (GEFS+), and one with a more complex phenotype associated with mild intellectual disability, skeletal and dental anomalies. Whole exome sequencing (WES) analysis in all the family members revealed a heterozygous SCN9A mutation, p.(Lys655Arg), shared among the father and the two probands, and a novel de novo loss of function mutation in the ANKRD11 gene, p.(Tyr1715*), in the proband with the more complex phenotype. The reassessment of the phenotypic features confirmed that the patient fulfilled the proposed diagnostic criteria for KBG syndrome, although complicated by early-onset isolated febrile seizures. 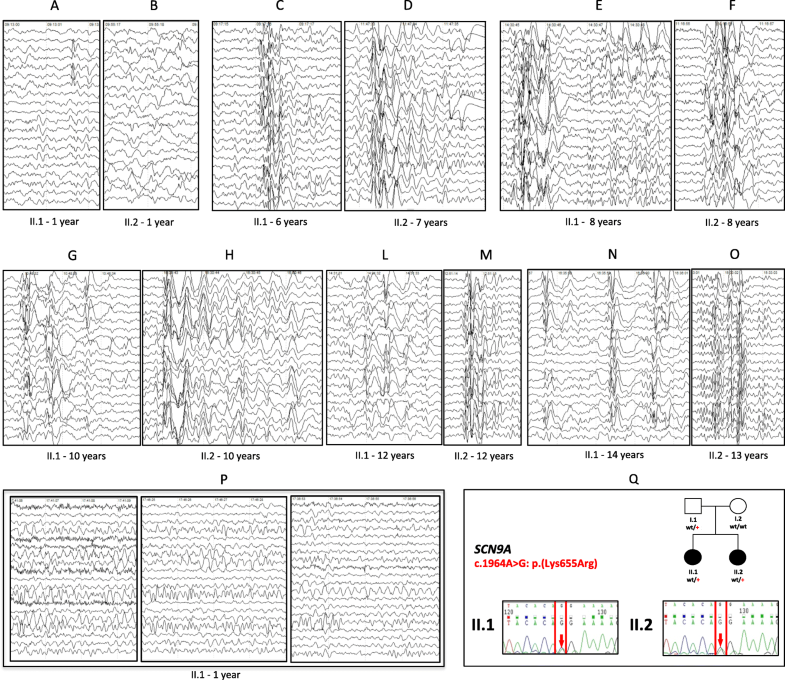 EEG abnormalities with or without seizures have been reported previously in some KBG cases. The shared variant, occurring in SCN9A, has been previously found in several individuals with GEFS+ and Dravet syndrome. This report describe a novel de novo variant in ANKRD11 causing a mild phenotype of KGB syndrome and further supports the association of monogenic pattern of SCN9A mutations with GEFS+. Our data expand the allelic spectrum of ANKRD11 mutations, providing the first Brazilian case of KBG syndrome. Furthermore, this study offers an example of how WES has been instrumental allowing us to better dissect the clinical phenotype under study, which is a multilocus variation aggregating in one proband, rather than a phenotypic expansion associated with a single genomic locus, underscoring the role of multiple rare variants at different loci in the etiology of clinical phenotypes making problematic the diagnostic path. The successful identification of the causal variant in a gene may not be sufficient, making it necessary to identify other variants that fully explain the clinical picture. The prevalence of blended phenotypes from multiple monogenic disorders is currently unknown and will require a systematic re-analysis of large WES datasets for proper diagnosis in daily practice. Whole Exome Sequencing (WES) technology introduces a remarkable revolution in the identification of disease-causing genes and a powerful tool for genetic diagnosis, mainly relevant for rare diseases, which is remarkably difficult for clinicians to be diagnosed. WES can substantially reduce the number of cases remaining undiagnosed for many years and has become the current standard for the diagnosis of highly heterogeneous rare disorders with suspected Mendelian inheritance. This approach is leading to better dissecting the clinical phenotype of patients, in particular, those related to phenotypic progression in association with a single locus and those derived from mixed phenotypes developing from multilocus genomic variants. Recent studies reported the presence of multiple genomic diagnoses in a single individual in 3.2–7.2% of cases [1–3]. Molecular variants in the SCN9A gene (MIM#603415) are responsible for a range of seizure disorders, which are characterized by early-onset isolated febrile seizures to generalized epilepsy with febrile seizures plus, type 7 (GEFS+), which identifies the most severe phenotype, as well as primary erythermalgia, callousness to pain linked to channelopathy and extreme paroxysmal pain disorder. Patients with isolated febrile seizures frequently showed an early onset between ages 5 months to 4 years and exhibit natural remission by age 6 years, while patients with GEFS+ persist in having various types of febrile and afebrile crises afterwards in life . The SCN9A gene encodes for NaV1.7, a voltage-gated sodium channel mainly expressed in the hippocampus during the embryonic phase, suggesting a key function in the central nervous system  and in nociception signaling. SCN9A has been proposed suggested as a genetic modifier in SCN1A mutation linked with GEFS+ and as a potential susceptibility gene for Dravet syndrome [6, 7]. In 1975, KBG syndrome was identified and characterized by specific clinical findings: macrodontia of the upper central incisors, distinctive craniofacial signs, short stature, skeletal abnormalities and neurological involvement that encompasses developmental delay, convulsions and intellectual disability [8–11]. The initial description of the KBG syndrome, named KBG based on the initials of first affected families’ surnames, referred to 7 patients from 3 unrelated families with a putative autosomal dominant inheritance [8, 12, 13]. To properly diagnose KBG syndrome, 4 or more of these 8 major criteria should be satisfied: (1) macrodontia of the upper central incisors, observed as a distinctive trait of KBG syndrome and reported in more than 95% of cases; (2) distinctive facial features (presence of at least three findings of six categories of craniofacial shape, hair/eyebrow, eyes, ears, nose and mouth); 3) hand abnormalities, (fifth finger clinodactyly, clinical brachydactyly, or short tubular bones on radiographic exam); (4) neurological implication, with magnetic resonance, global developmental delay, and/or a seizure disorder; (5) bone age > 2 SD below the average; (6) costovertebral abnormalities, (abnormal curvature of the spine, cervical ribs, or vertebral/endplate defects); (7) postnatal short stature (as a height less than 3rd centile); and (8) occurrence of a first-degree relative affected by KBG syndrome. In 2011, Sirmaci et al.,  identified pathogenic heterozygous variants in the ANKRD11 gene (MIM# 611192). Single nucleotide mutations and small indels represent about 83% of the pathogenic variants identified within ANKRD11 and larger copy number variants (mostly deletions) represent about 17% [15–17]. ANKRD11 represents one of the family members of ankyrin repeat-containing cofactors that relates with p160 nuclear receptor coactivators (NCOA1) by recruiting histone deacetylases to inhibit ligand-dependent transcriptional activation [14, 18, 19]. ANKRD11 was also found to localize inside the neurons nuclei and to accumulate in distinct inclusions after their depolarization. This finding suggests that ANKRD11 represents one of the major players in neural plasticity . Here, we report two sisters from a non-consanguineous family, presenting generalized epilepsy with febrile seizures plus (GEFS+; MIM#613863) associated with an heterozygous mutation in the SCN9A gene, p.(Lys655Arg), inherited from the father that was asymptomatic for the crisis, and a novel de novo loss of function mutation in the exon 10 of the ANKRD11 gene, p.(Tyr1715*) in one sister with a clinical phenotype compatible with KBG syndrome (MIM#148050). The reported family comes from Brazil and the two probands share a GEFS+ phenotypic spectrum. The original purpose of our study was to find the molecular causes of such phenotype. All members of the family were clinically assessed and diagnosed by the respective clinical neurologist and geneticist. Female 14.5 years old. Delivered full term, by emergency C-section, due to lack of fetal movement, weighing 2.971 Kg, 48 cm long and 33 cm head circumference. Neonatal period had no complications. From the neonatal period onward, she showed difficulty to breastfeed, with low weight gain. At 9 months old, she had myoclonus-atonic type seizures with sudden falling of the head and trunk. Initially precipitated by fever, these seizures became afebrile and daily, several times a day, and were controlled after substituting phenobarbital for sodium valproate (VPA), in low doses. The EEG tests initially showed focal spikes (centro-temporal regions) and only at 4 age, one EEG test showed a theta rhythm (4-5 Hz) in the temporo-occipital regions (T5-O1; T6-O2). At the age of 4 years and 8 months, after remission of seizures for 3 years, and normal EEG tests, VPA was suspended. 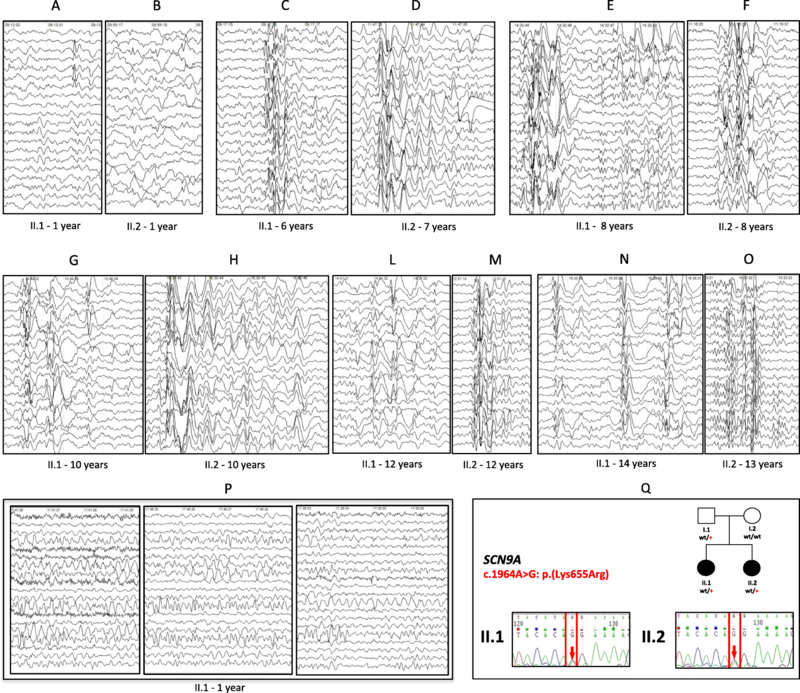 Starting from 6 years of age, the EEG tests showed persistence of several bursts of irregular generalized polyspike-wave (PSW) and spike-wave discharge (SW), lasting 1–3 s. (Fig. 1a-p). Despite persisting abnormal EEGs, patient has not presented relapse of seizures and is not on medication. Patient presented with recurrent otitis episodes and developed conductive hearing loss in left ear. A computed tomography scan of the mastoid showed signs of otomastoiditis in the left ear with obliteration of Prussak’s space and cholesteatomatous process. Orthodontic evaluation conducted at 8 years of age showed dolichofacial pattern, maxillary protrusion, absence of lip seal, delayed eruption of permanent teeth, besides size increase of upper central incisors, with extra mamelar structures and whitish material of incisors and other teeth, compatible with hypoplasia (Fig. 2a, b). Cone-beam computed tomography of right oral lower-posterior region at 14.5 years of age, revealed dental units partially erupting and the presence of mixed-aspect images located between the dental roots, suggesting bone dysplasia (Fig. 2). The skeletal X-ray assessment showed inversion of physiological cervical lordosis (Fig. 2c); deviation of left dorsal axis, accentuated thoracic and lumbar lordosis and concealed spina bifida at L5/S1 (Fig. 2f). The proband has also shortening of the distal phalanx of the 5th finger, clinodactyly of the 2th and 5th (Fig. 2d, e); myopia; bifid uvula with submucous cleft palate; weight and height growth curve below percentile < 5. Neuropsychological analysis at age 8 showed IQ of 73. Female 13 years old. Showed normal neurological development. At 12 months, she had the first febrile seizure. She had recurring febrile seizures kept under control with low doses of VPA. After 3.8 years with no relapse of seizures and normal EEGs, VPA was suspended. At age 8, the same electroencephalographic pattern observed in her sister appeared on the EEG (Fig. 1 a-p), with persistence of bursts of irregular generalized polyspike-wave (PSW) and spike-wave discharge (SW), less frequent and with shorter extent, with no relapse of seizures and no medication. She presents normal neuro-psychomotor and weight-height development, and an absence of dysmorphic and radiologic alterations. Peripheral blood lymphocytes were collected from all affected individuals and their parents, and genomic DNA was extracted using a salting out procedure . An array based Comparative Genomic Hybridization (CGH) analysis was done using commercially available Human Genome CGH Microarray (Agilent Technologies, Waldbronn, Germany) with an estimated average resolution of 13Kb (SurePrint G3 Human CGH Microarray). NGS panel analysis was performed by Ampliseq/Ion Torrent technology with at least 120X using a targeted re-sequencing of 21 genes implicated in juvenile forms of epilepsy (ARHGEF9, KCNQ2, PRRT2, PNKP, ST3GAL3, SCN1A, GRIN2A, SCN8A, SLC2A1, SPTAN1, SCN2A, ALDHTA1, PCDH19, ARX, TBC1D24, KCNT1, PLCB1, STXBP1, PNPO, CDKL5, SLC25A22). No pathogenic variant has been identified with this method in our siblings. One hundred nanograms of genomic DNA was used for DNA library preparation and exome enrichment using the Nextera Rapid Capture Expanded Exome Kit (Illumina) according to manufacturer instructions. DNA1000 chips (Agilent) and Qubit dsDNA BR Assay Kits (Invitrogen) were used to assess the quality of libraries. An indexed paired-end sequencing run (101 + 7 + 101 bp) was performed on a HiSeq 2000 using SBS Kit v3 chemistry (Illumina). Using an analysis pipeline implemented in Orione , we performed read alignment to the human reference genome (hg19) using the Burrows-Wheeler Aligner 7 (BWA-MEM; version 0.7.5a) and GATK framework (version 2.8.1). Using GATK Unified Genotyper and GATK Variant Annotator modules, we annotated the variants as known or novel based on dbSNP146 and SnpSift/ SnpEff and KGGSeq. We used different models (SIFT, Polyphen2, LRT, MutationTaster, MutationAssessor and FATHMM) to assess the functional predictions for the aminoacid changes. We filtered the identified variants according to recessive/dominant/de novo pattern of inheritance, gene features and MAF < 1% using as references dbSNP138, dbSNP141, 1000 Genomes, ESP6500, ExAC, gnomAD and EVADE, our private database of about 600 exomes). Subsequently, variants were evaluated for their phenotypic and biological impact. The average target coverage was 93.5, 83.6, 88.1 and 78.9 for father, mother, case II-1 and case II-2, respectively. The target region was covered at least 10X in 93% for the father, 92% for the mother, 93% the older sister and 92% the younger. After filtering of the variants and the quality assessment in IGV browser, we identified a SCN9A: NM_002977:c.1964A > G: p.(Lys655Arg) (rs121908919); chr2:167138296 T/C in hg19 variant in both cases, inherited from an unaffected father. Additionally, we found a novel de novo truncating mutation in exon 10 of the ANKRD11 gene: NM_001256182:c.5145C > G: p.(Tyr1715*); chr16:89347805 G/C in hg19 in case II-1 (Figs. 1 and 2). We report here a dual diagnosis in case II-1 presenting with ANKRD11 and SCN9A pathogenic variants found by WES. The variant in ANKRD11 has never been reported so far in literature. Considering that it is de novo, we supposed a possible mosaicism in the parents but we were not able to find any by WES analysis. The reassessment of phenotypic features in case II-1 confirmed that she fulfilled the proposed diagnostic criteria for KBG syndrome, complicated by early-onset isolated febrile seizures, although EEG abnormalities with or without seizures have been reported in some KBG cases . In particular, she presented with macrodontia, hand anomalies, neurological involvement, costovertebral anomalies and post-natal short stature. This is the first Brazilian case reported so far. The KBG syndrome is very rare, with about 100 individuals reported so far in literature [15, 16]. Probably it is underdiagnosed due to the clinical features that can be mild and common to other diseases. ANKRD11 mutations have been found in patients identified in a large number of subjects with characteristics consistent with Cornelia de Lange syndrome (see, for example, CDLS1 MIM#122470), thus showing phenotypic overlap between the two disorders. As previously reported [22, 23], some KBG patients could be recognized by gestalt, others may look like Cornelia de Lange syndrome (CDLS). CDLS and KBG represent two rare and distinct syndromes, but they have clinical aspects that overlap such as cognitive deficit, growth retardation and certain craniofacial abnormalities (brachycephaly, wide eyebrows and nostrils anti-vertite). Other common features are limb abnormalities such as small hands and feet, clinodactyly of the fifth finger and syndactyly of the second and third toes. Five different genes associated with the cohesin complex and its regulation (NIPBL, SMC1A, SMC3, HDAC8 and RAD21), showed heterozygous mutations identified in patients with CDLS. The cohesin complex regulate gene expression mediating transcriptional activation and repression . The main function of ANKRD11 is to suppress transcriptional activation of the target genes of nuclear receptors by enrolling deacetylase at different promoters . It is reasonable to assume that dysregulation of functionally correlated genes by cohesin complex deficiency or ANKRD11 may result in overlapping phenotypic characteristics . The shared variant p.(Lys655Arg), occurring in SCN9A, has been previously found in several individuals: one with GEFS+ and two with Dravet syndrome. Additionally, one of these individual also possesses a de novo SCN1A mutation  and another affected by atypical benign partial epilepsy (ABPE) of childhood, harbored variants in in the CPA6 and SCNM1 genes associated with epilepsy . Although already shown to play important pathogenic roles in epilepsy and predicted to significantly alter protein function, the p.(Lys655Arg) variant was detected in asymptomatic parents and has been found with extremely low frequency in control cohorts (NHLBI GO Exome Sequencing Project and ExAC Browser).The SCN9A p.Lys655Arg variant found in our sisters seems to be associated with an early-onset isolated febrile seizures. Other subjects showing febrile seizures or GEFS+, that possess SCN9A mutations were sporadic and cannot offer powerful evidence for a specific role of SCN9A in seizure disorders that is presently under debate. Therefore, this report would further support that SCN9A mutations are linked to a monogenic pattern. The 39-year-old father, carrier of the same SCN9A variant, has not reported any history of seizures. Considering that most febrile seizures would naturally remit with age, we reinvestigated the family but we did not find evidence of history of seizure disorders in the father. However, he has had attention-deficit hyperactivity disorder since childhood and his family history shows neuropsychiatric disorders (dementia, schizophrenia, personality disorder, panic disorder, depression, delayed development, intellectual disability and autism spectrum disorder). The phenotype of patients with GEFS+ combine febrile seizures, absence seizures, partial seizures, myoclonic seizures, or atonic seizures, with a variable degree of severity . In a recent paper , none of the GEFS+ families analyzed could be completely clarified by high penetrance of SCN9A mutations. Moreover, it is not surprising to identify a non-penetrant individual because they are commonly identified in autosomal dominant diseases and well documented in pedigrees of febrile crises (60–80% of penetrance ). This study provides an example of how WES has been instrumental allowing us to dissect the clinical phenotype, which is a multilocus variation aggregating in one proband. The successful identification of causal variant in a gene may not be sufficient, making it necessary to identify other variants that can fully explain the clinical picture. In several series of studies, the presence of multiple molecular diagnoses in a single individual has been described in 3.2–7.2% of cases that underwent molecular analysis, but large cohorts of patients and its associated clinical studies  are lacking to clearly define this phenomenon. This report emphasizes the critical role of the clinician in diagnostic genomic analyses and highlights the advantages of WES technology in the genetic dissection of a heterogeneous phenotype. In our study, we prove that apparent phenotypic expansion may represent blended phenotypes resulting from pathogenic variation at more than one locus, so allowing a dissection of genotype–phenotype relationships. Due to the lack of the prevalence of blended phenotypes from multiple monogenic disorders, a systematic re-analysis of WES data sets is needed to a proper diagnosis in daily practice. We are sincerely grateful to the family for participating in this study. All of the authors would like to thank the CRS4 HPC group for IT support and computational infrastructure and Leonardo Barata of the Clinic Ponto Alto diagnostic by image for support in image analysis. MFV, FCRZ, HPP, LCNV, MVAP and MBPT were responsible for acquisition of the clinical information and instrumental evaluation of patients. RA, AA and LC conceived and designed the experiments. MO, GP and IP performed the experiments. AA, PU, SO, GC and RA analyzed the data and performed statistical analysis. MBPT, RMA, FC, AA and LC jointly supervised research. RA, AA and LC wrote the paper with input from all coauthors. All authors read and approved the final version of the manuscript. The study protocol was performed in accordance with the Declaration of Helsinki and approved by the Ethics and Research Committee of the University Hospital Professor Edgard Santos in Bahia, Brasil (CEP/HUPES opinion No 121/2013). Written informed consent to publish medical information and images, reported in this publication, was obtained from all patients and/or parents of patients when not over 18 years old.